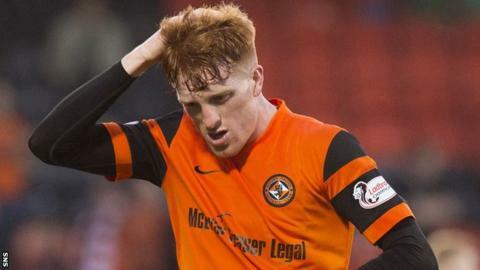 Simon Murray is free to play in the Premiership play-off final second leg after Dundee United appealed against his second yellow card in the first. The striker was booked twice for simulation in Thursday's 0-0 draw with Hamilton Academical at Tannadice. But his appeal will not be heard until next Thursday, meaning the 25-year-old will not be suspended on Sunday. Murray appeared to be fouled in the penalty box by Scott McMann before falling with 13 minutes remaining. Confirming their appeal, United said in a club statement that they had "subsequently received notification from the Scottish FA that Simon will be available to play in Sunday's second leg". Immediately after the match, United manager Ray McKinnon had said: "I can only say I'm very disappointed with the penalty decision. "At the time, we thought it was a penalty. We've seen it back now and it's obviously been confirmed there was a penalty." Referee Steven McLean appeared to receive guidance from his assistant before showing United's top scorer a second yellow. "The referee, Steven, he's made a really poor decision," said McKinnon. "I don't think he's had any help from his linesman there at all. It's very clear-cut. "All you can ask for in big games like this and good referees like Steven is to get the big decisions right because that could've really impacted on us, totally. "We were down to 10 men. Effectively, we could've had a penalty to go 1-0 up, so the whole tie would've been different." Murray had scored in all four play-off games ahead of Thursday's goal-less draw and McKinnon was determined to make sure he played at Hamilton. Hamilton manager Martin Canning, whose side are looking to avoid relegation, said he "didn't see" the McMann challenge on Murray. "If we go and take our chances in the first half - we had two or three real good opportunities - it could be irrelevant," said Canning. "There's no goals, but there's people hobbling about at the end of the game for us, obviously a sending off for them. "Now, it's going to be a difficult second leg - one we need to make sure we compete in." Accies will be without suspended captain Mikey Devlin, who missed the first leg through injury, and midfielder Darian MacKinnon, who is also banned for the second leg. Veteran midfielder Massimo Donati and winger Dougie Imrie also ended the game with injuries. "We'll need to assess the injuries," added Canning. "We've got Darian definitely out and now we've got Massimo and Dougie potentials, so we need to wait and see."